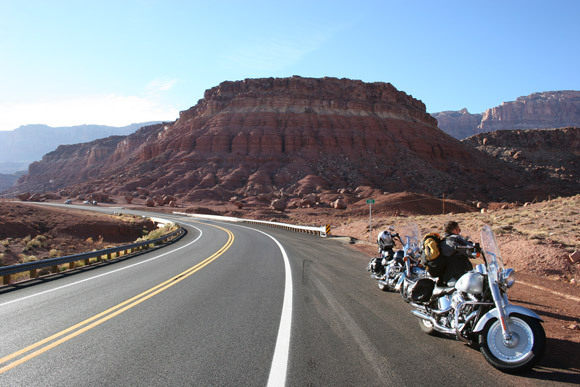 Motorcycles and Route 66 were made for each other. Photo (cc) by Jerry Pank. Before the twentieth century, the West Coast of the United States was greatly isolated from the East and Midwest by vast stretches of wilderness, deserts and imposing mountain barriers. Until the transcontinental railroad was finished in 1869, it was faster and easier to sail a ship around the southern tip of South America than it was to mount an expedition across our great nation. Top: Holbrook's Wigwam Motel was built in 1950 and is listed in the National Register of Historic Places. Photo (cc) by Richie Diesterheft. 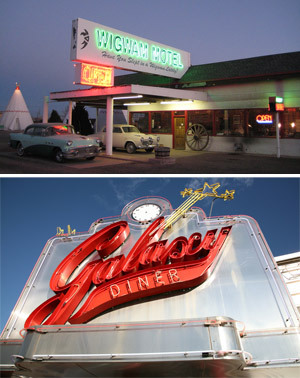 Bottom: The Galaxy Diner in Flagstaff. Photo (cc) by Paul Stumpr. Once the railroad blazed a trail into the country’s interior, road-building began in earnest. Running parallel to the railroad tracks for miles is the most celebrated motorway in the United States; legendary Route 66. Completed in 1926, the historic thoroughfare originally ran between Chicago and Los Angeles. For almost fifty years, it was the primary commercial highway and main tourist artery to the West Coast. Flagstaff, Arizona is the highest point on Route 66. The road significantly improved the accessibility to northern Arizona and enhanced the culture and tourism in Flagstaff. Over time, Route 66 acquired a certain mythical charm that is still fondly remembered. From the Arizona-New Mexico state line past Flagstaff, Arizona, Route 66 has long been side stepped by Interstate 40. A lot of the road lies parallel to the Interstate, but Route 66 still prevails as the Main Streets in Holbrook, Joseph City and Winslow. A trip through these towns offer glimpses of how life was on the Mother Road, America’s First Mainstreet. Holbrook and Winslow’s Main Streets still echo the spirit of Route 66, including the old courthouse, wigwams in Holbrook and the “Standing on a Corner” park in Winslow. Historic Route 66 also runs east-west through Flagstaff, Arizona, and is a major thoroughfare for local traffic. Even though its glory days have faded and much of the classic highway has vanished, the sentimental attraction of this road lives on. Each September, Flagstaff hosts the annual Route 66 Days, to celebrate its connection to the fabled highway.